56 Comments	This post may contain affiliate links. 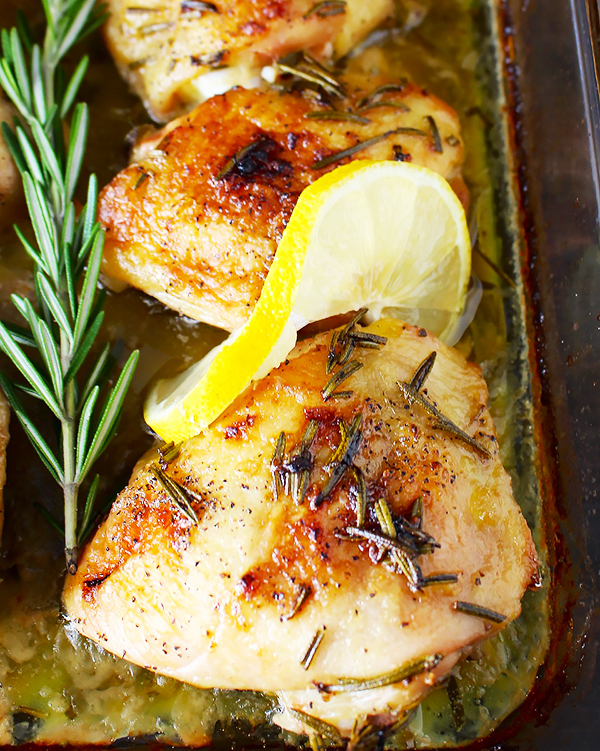 This Paleo Lemon Butter Chicken is easy to make, is full of fresh flavors, and is so delicious! Gluten free, dairy free, and Whole30. 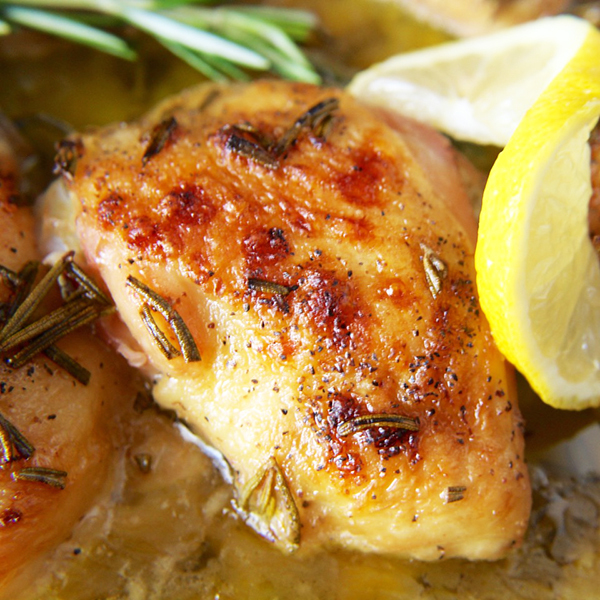 Ok, so this is technically Lemon Ghee Chicken, but butter just sounds better. These thighs are coated in a scrumptious sauce that consists of ghee, coconut cream, garlic, lemon zest and juice, and fresh rosemary. 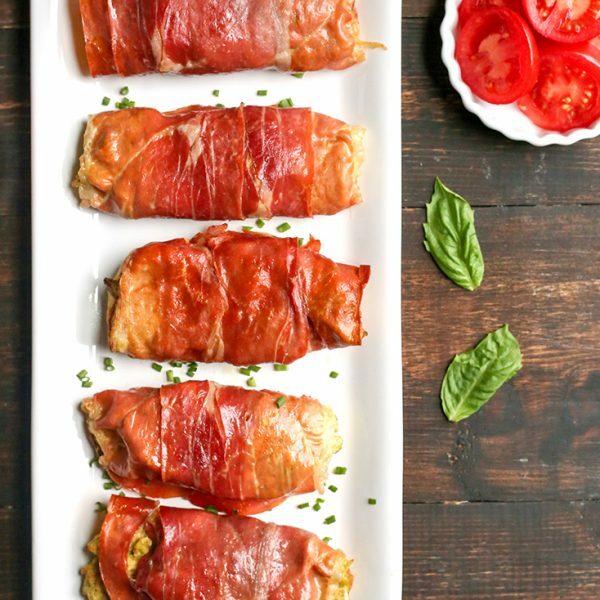 It is poured all over the thighs then they are baked making it a seriously easy meal! 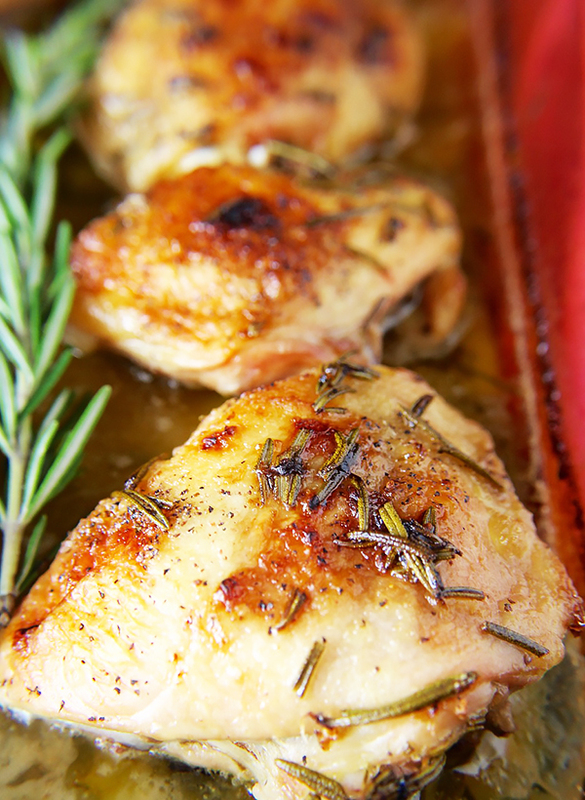 Thighs are probably my favorite piece of chicken to use because they’re affordable, juicy, and easy to eat. I actually was inspired for this meal by another blogger. Damn Delicious posed a similar version and when I saw it I knew I wanted to make it paleo. It was easy to do- swapping the butter for ghee, cream for coconut cream, leaving out the parmesan, and I replaced the thyme with rosemary. 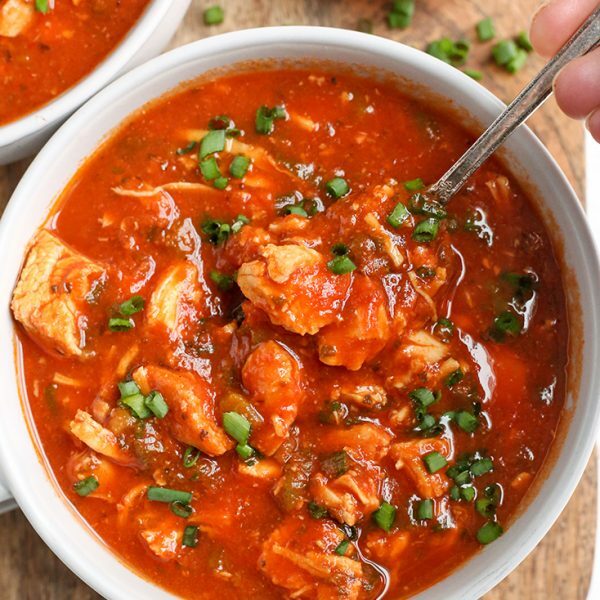 It’s one of out favorites and just works perfect in this dish. The results were amazing!! This meal comes together quick, and while it does bake for a little while, it’s all hands off. You can easily be preparing a side dish or doing whatever else you need to do. This has turned into one of my husbands favorite meals already. He told me he wants to drink the sauce because it’s so good! Ok, I actually saw him tip his plate up to get every last drop. You will love how easy and affordable this meal is. 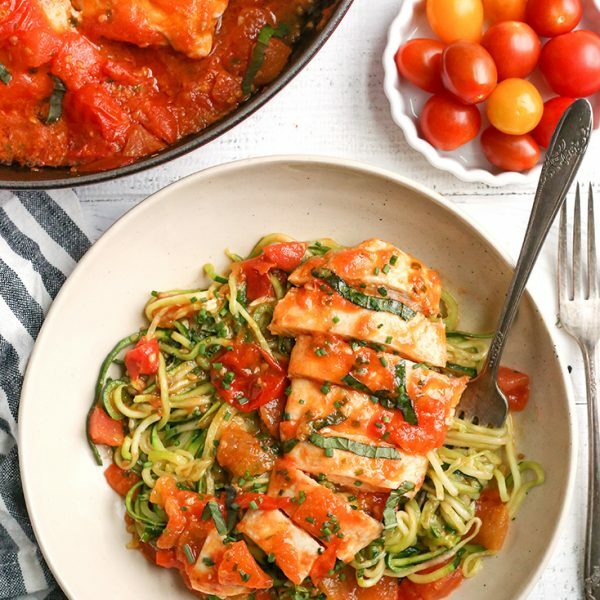 A delicious, healthy dinner that everyone will enjoy! Another delicious Whole30 recipe to add to your menu. Preheat the oven to 375° and place the chicken thighs skin side down in a 13x9 pan. Sprinkle lightly with salt then flip over so the skin side is up. Set aside. In a medium saucepan, combine lemon zest and juice, ghee, coconut cream, garlic powder, salt, and rosemary. Stir over medium heat until everything is well combined. Pour the mixture over the thighs and bake for 40-45 minutes or until they reach 165°. If you want the skin crispy, turn up the oven to 500° and bake for another 5-10 minutes. Wow! Made this for dinner tonight and everyone devoured it!! 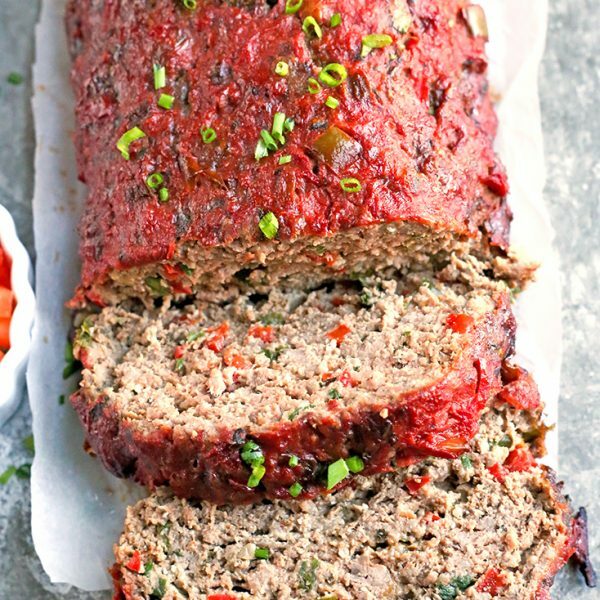 Thank you for such an easy weeknight meal that doesn’t sacrifice flavor! You’re welcome, Dianne! Thanks for trying it and I’m so glad it was enjoyed!